Check out these arch doorway images that have been taken from projects over the years. CurveMakers interior archway openings can be configured for most any size and jamb depth. We can also modify to fit a custom casing profile to closer match your existing details. Check out the wood arch trim details below! Interior Archway Trim Products in a grand foyer. Elliptical Style Arches with keystones, capitals, and Plinth blocks. 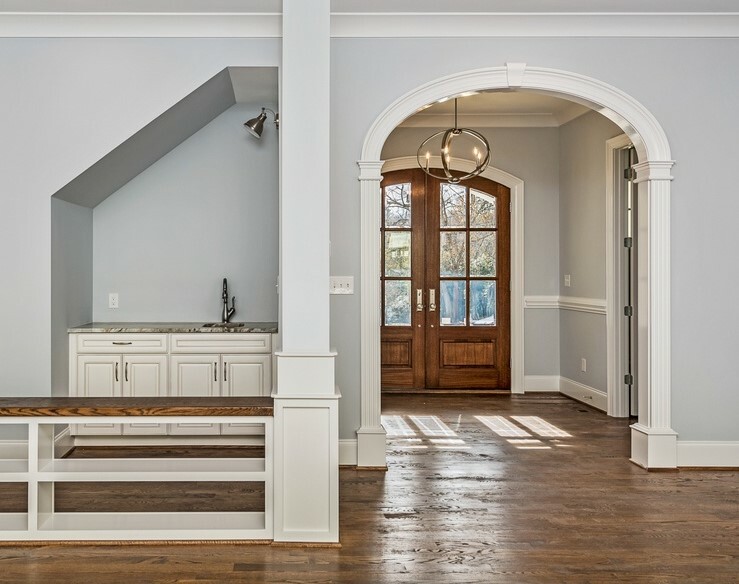 Elliptical Foyer Arched Opening in modern farmhouse setting. Six foot wide arched opening. Model A style. Arched Opening, Model A style in foyer. Solid Wood Archway Trim Kit. family room arched door openings - 14 feet wide! arch trim details in kitchen, butler pantry, and dining room. ez arch style with 470 casing profile. Traditional Arched Opening detail in foyer setting. 5” wide casing profile. Fluted Columns. Elliptical shape. interior archway trim in foyer entry. office doors have arch transom. segment shape arched openings. arched pocket doors - prefab arch kit split to fit concentric panel pocket doors!